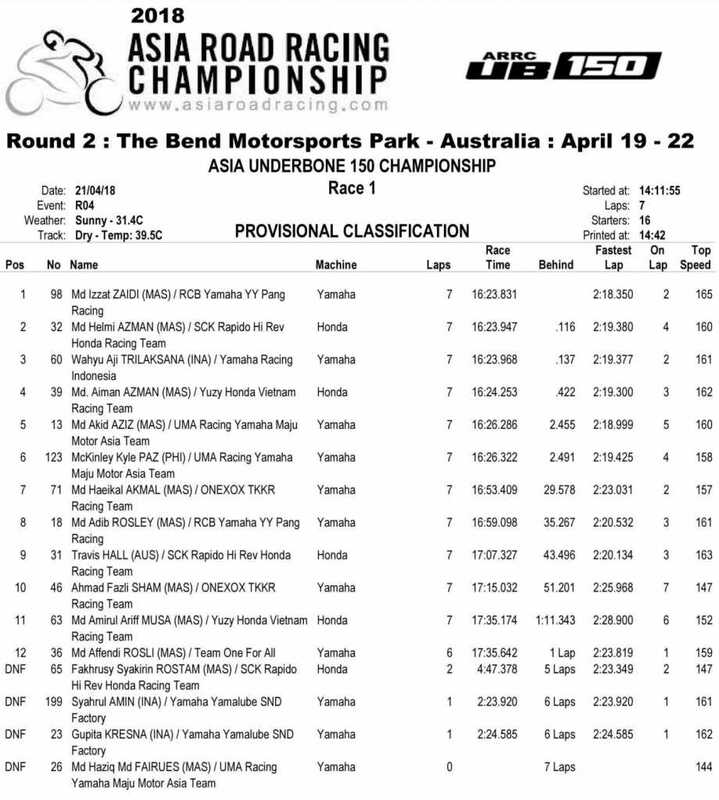 The Underbone 150cc class of the Asia Road Racing Championship added several thousand new Australians to its global fan base today after a close fought Race 1 at The Bend Motosport Park. The highly tuned, 150cc, 100kg, 130 decibel, 170km/h slipstreaming missiles put on a spectacular seven lap show at Australia’s newest international circuit, at the end of which just four tenths of a second separated the first four finishers. SCK Rapido Hi Rev Honda’s championship leader, Helmi Azman led from the start, chased hard by 2016 title winner, Wahyu Aji Trilaksana, Filipino wildcard, McKinley Kyle Paz, Affendi Rosli, Izzat Zaidi and then Aiman Azman, who was quick to catch the leading group after starting from the back of the grid. Helmi looked comfortable throughout, despite the close attention of Kyle Paz, who was full of bluster and self belief. Wahyu Aji, looking to salvage his title chances after being handed heavy penalties. The six riders sparred and played mind games with each other until the start of the last lap, when they pulled the pin, jockeying for a position that would enable them to win the drag to the chequered flag. 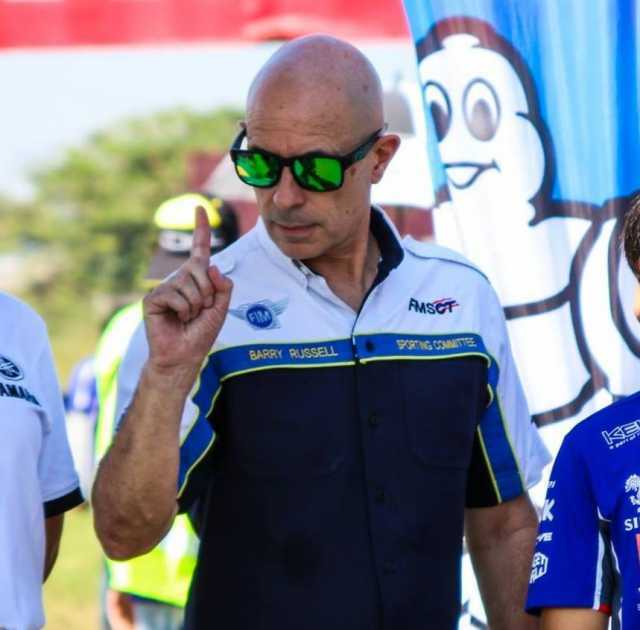 In the process, Kyle Paz took himself out of contention by running onto the grass and Affendi Rosli crashed, leaving four riders. As they approached the last sector, Helmi, Wahyu Aji and Izzat got a few bike lengths on Aiman, coming into the penultimate turn 17 abreast of each other. Izzat got the RCB YY Pang Yamaha hooked up as they came out of Turn 18 and onto the home straight to get across the line one tenth ahead of Helmi, who just held onto second from place from a determined Wahyu Aji. 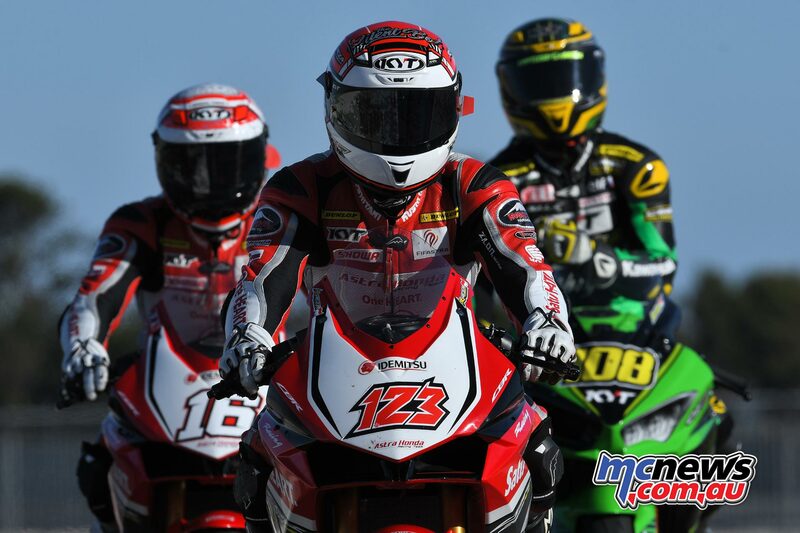 It was Izzat’s second win in three races in 2018, increasing his championship score to 58, which is two points above Helmi, so both Malaysian riders were pleased with their results. Wahyu Aji was happy enough to restart his 2018 campaign with a clean third place, though will be out to improve in Race 2 on Sunday. Behind the first three, Aiman did well to bring his Yuzy Vietnam Honda home in fourth place ahead of 2017 champion, Akid Aziz and Kyle Lapaz, who recovered from his excursion to finish sixth. Wildcard Travis Hall again impressed as Helmi’s team mate to finish ninth. 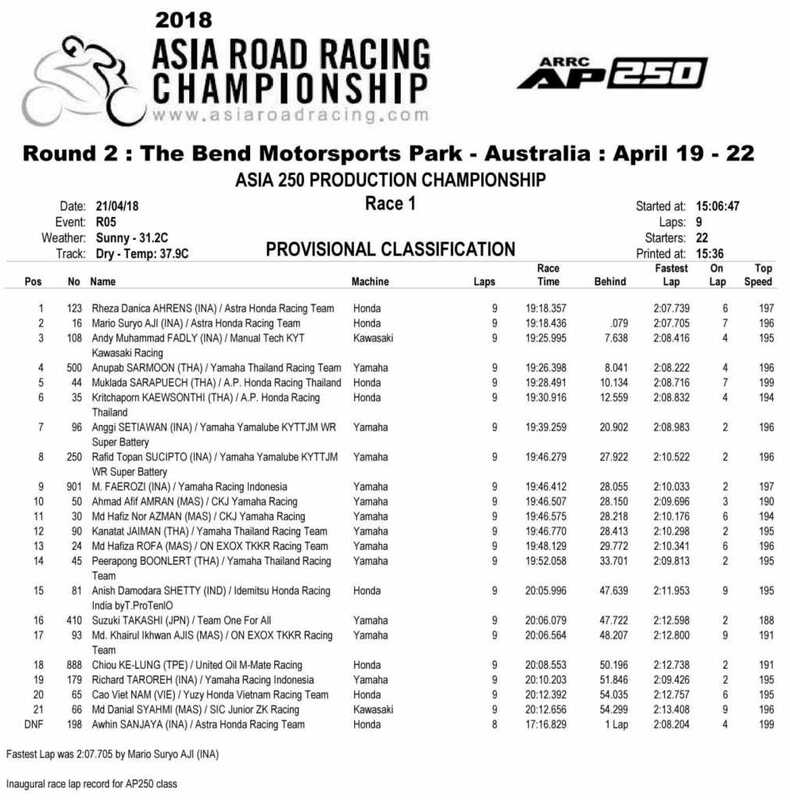 Indonesia turned the tables on a Thai contingent that emerged from Round 1 with a clear national advantage at Tailem Bend in the first of two races today at The bend Motorsport Park. Astra Honda Racing Team came close to a pulling off a perfect 1-2-3 afternoon in a tense first race for the ARRC intermediate class. 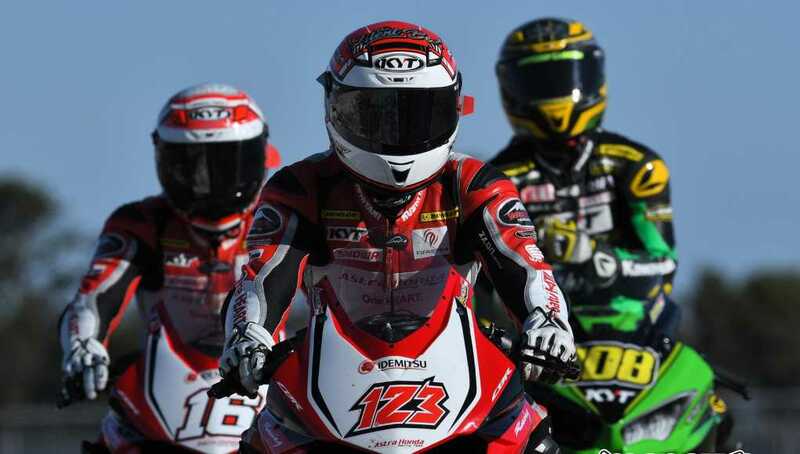 The team’s three riders, Rheza Danica Ahrens, Mario Suryo Aji and Awhin Sanjaya all started from the front row of the grid with a clear intention to convert their qualifying advantage into a podium lockout. As Rheza and Mario got onto a pace that the rest of the field was unable to match, Awhin was left in a fight with championship leader, Anuparb Sarmoon and Andy Muhammad Fadly for the final place on the podium. It was an intriguing battle between the indomitable Anuparb and the two 20-year-old Indonesians. Awhin blinked first and crashed on the final lap and Fadly claimed third position from Anuparb. It was a popular first podium for Manual Tech KYT Kawasaki’s Andy Fadly, whose natural speed appears to be evolving into good finishing results. Behind Anuparb in fourth was Muklada Sarapuech, who recovered well from from her 11th place start to finish fifth from team mate, Kritchaporn Kawsonthi. Anggi Setiawan, Rafid Topan Sucipto, Muhammad Faerozi and Ahmad Afif Amran completed the top ten. Grid positions for Race 2 will be based on Qualifying Practice results and will not be affected by Race 1 finishing positions. ‘Super Mario’, as well as chalking up another podium, recorded the best alp of the race at 2:07.705. In one of the strangest races seen in the 22-year history of the Asia Road Racing Championship, Race 1 was abandoned after the red flag was shown first, when race leader Yuki Ito high-sided on lap 4 and then again when Azlan Shah Kamaruzaman crashed at the same spot in the re-started race after just two laps had been completed. Broc Peason had crashed a couple of laps earlier and was taken to hospital with spinal injuries. Other fallers included WeBike Ikazuchi’s Joe Francis, who is standing in for Anthony West, Hong Leong’s Kasma Daniel Kasmayuddin, Ahmad Yudhistira and Tomoyoshi Koyama.